Whether you are planning to sell your home in the next few months or the next 5 years, now is the time to start getting it ready so you can enjoy it AND have it ready to list when the time comes. There are some things that can be done ahead and some that should be revisited closer to listing. Shortly before Thanksgiving, I got a message from an innkeeper who had just discovered that we offered a holiday decorating service. She was wondering if it was too late to hire us for an installation that needed to be done the week after Thanksgiving in order to be ready for the local Christmas Prelude celebrations which include tours of the historic inns…including hers. We were able, with some juggling, to squeeze in a site assessment visit, a couple days of shopping and her installation just in the nick of time! The week after Thanksgiving was crazy busy with commercial Christmas decorating projects. We are happy to style with existing decoration and supplement with some new purchases or provide a whole new look with brand new décor. 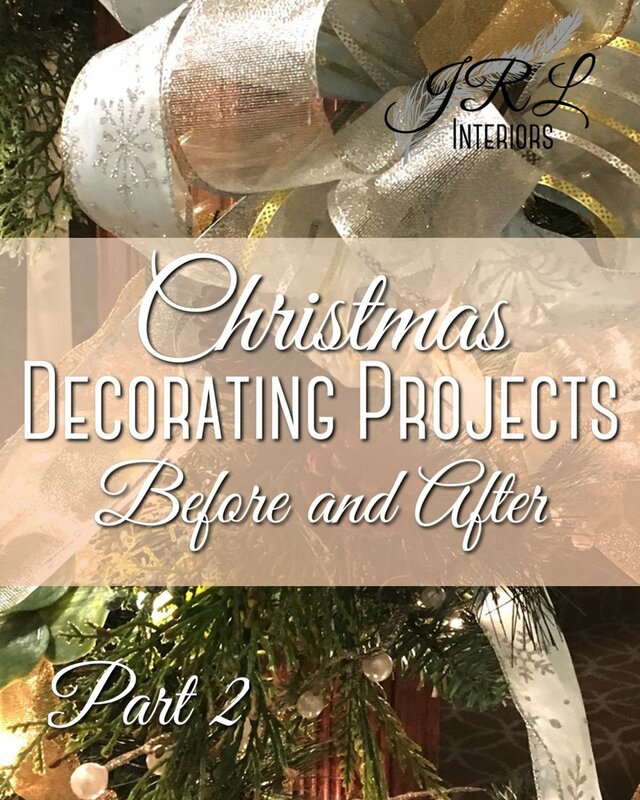 We always begin with a consultation to talk about the spaces that need to be decorated and to see what decorations are available that might be re-used. Following that, we propose a uniquely tailored plan and a budget for any new purchases, sign a contract, and we are off and running to make it all happen! 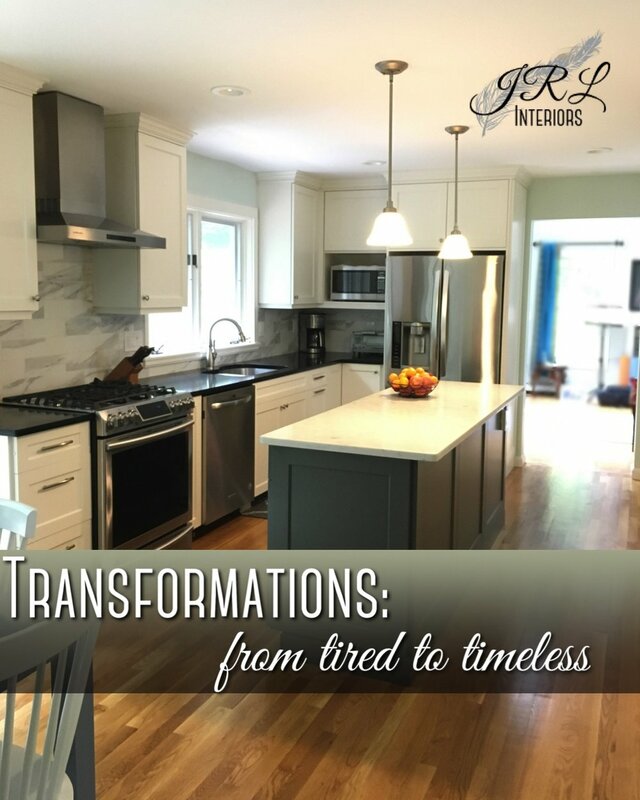 Frustrated with her dark and dated kitchen, our client knew it was time for an overhaul. Traveling extensively for her job, and short on time, she wanted her kitchen to be a welcome retreat for cooking, not an exercise in perseverance when she was home. It was past time ... this sunny and spacious master bedroom had been beautifully crafted in a feminine periwinkle, rose and green palette starring a jacobean floral chintz and embellished with ruffles and bows, with periwinkle paint and wall-to-wall cut pile wool carpet ... but that was 20-something years ago and the fabrics and style were showing their age. Here are some 'before' pictures ... you may remember this era...Mario Buatta, "The Prince of Chintz" was inspiring beautiful, detailed and embellished floral interiors and this one was right on trend at the time. While they had loved the room for over two decades, the clients were ready for a change that reflected a more current, simpler look and inspired more of a retreat-like feeling. The space has a lot going for it - it is ample in size with vaulted ceilings and an abundance of natural light from a pair of skylights, a large arched window and two additional windows. 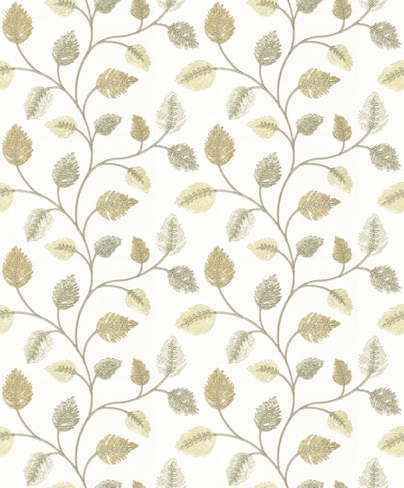 We selected a sophisticated neutral color scheme of taupe, grey, and white. 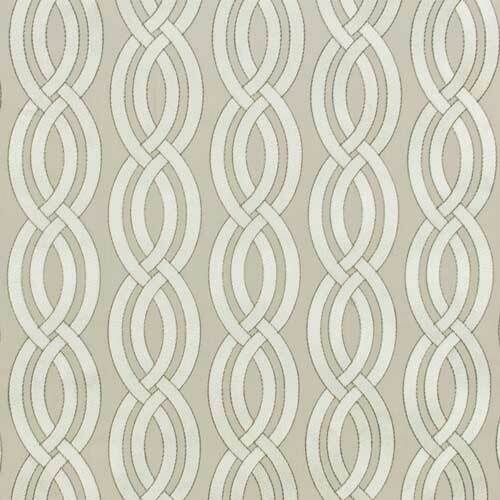 A textured taupe wool carpet covers the floor and taupe paint wraps the walls. A new bronze toned metal headboard, black console table, and new French linen grey painted nightstand chests anchor the space and pair well with the existing walnut dressers and dark mahogany armoire. 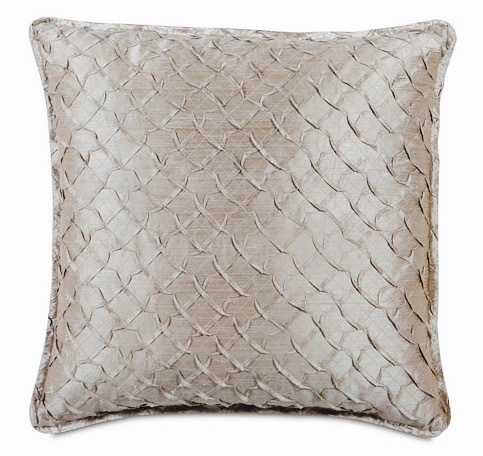 Fabrics were selected for varying texture and pattern to keep the neutral color palette anything but boring. A Custom tailored dust skirt and flanged shams of this textured stripe, were paired with pin tucked silk euro shams and a white matelasse coverlet and shams with scalloped edges. 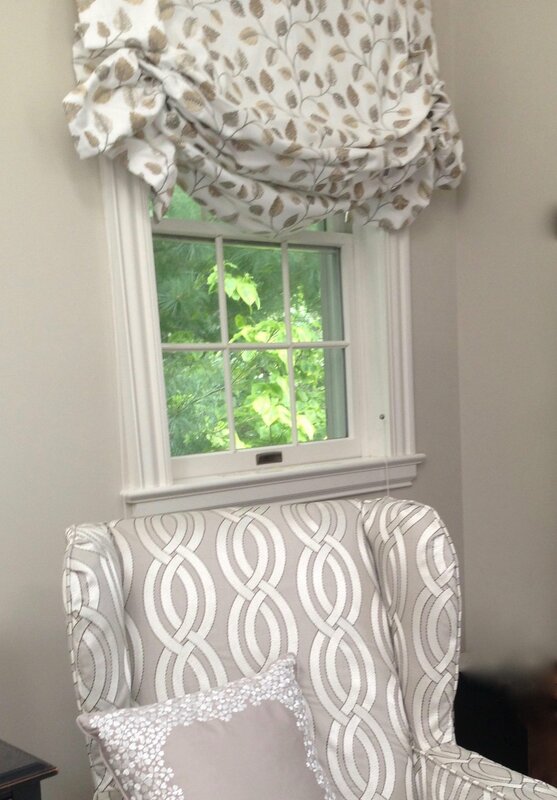 And the wing chair was slipcovered in this helical stripe woven with window treatments in an embroidered linen organic pattern featuring leafy vines in shades of taupe, grey, and beige. The window treatments were simplified on the arched window to a graceful pair of goblet pleat panels with understated covered buttons at the base of each pleat - hung from a custom iron rod and rings with a painted French silver finish. 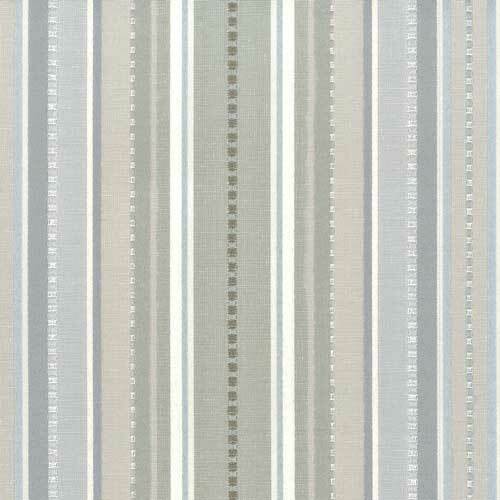 The covered button details continue on the side windows, but this time as the embellishment at the top of the inverted pleats of soft Roman shades. Sometimes, updating your space doesn't mean starting from scratch. When one of our favorite clients called us about updating the look in her well-used family room, we knew just what to do. This was one of the first spaces we tackled 15 years ago when we began working on this lovely antique colonial with the homeowners. At the time, we selected the paint colors, designed the window coverings and specified the furnishings, rug, and lamps. The original arrangement (shown above) worked well, but after 15 years of daily use, the homeowner was ready for a refresh. We kept the paint colors, window treatments, and lamps. Antique pine case goods and distressed finish tables still worked well but we opted to update the upholstery beginning with a new, more transitional styled sofa in a high performance fabric that would stand up to snuggling with the grandchildren. The solid wool sisal rug was exchanged for a patterned, more contemporary style area rug, and the chairs and ottomans were recovered in luscious textures and friendly stripes that echo the colors in the rug. Now all the generations of the family can enjoy the new space for years to come! Recently, a client requested our help in planning a bedroom overhaul to create a fresh new guest room space for the impending visit of her daughter and brand new grand-daughter. She wanted something that would be youthful and welcoming, but also pay tribute to her close knit family. We suggested a color scheme derived from a fun throw pillow that seemed to fit the criteria well, and we were off and running! Walls were freshened with a light spring green paint color, white wood blinds add privacy and light control and the cordless feature ensures safety for the growing grandchildren. Black iron curtain rods echo the style and finish of the headboard and hold simple white curtain panels trimmed in turquoise. A colorful wicker chair and upholstered stool pair with a floor lamp and side table to create a cozy reading corner. Eminently washable (and bleachable!) white matelasse covers the bed, while the comforter and shams and a tailored bedskirt inject a dose of vibrant turquoise. One bedside table is a reclaimed piece painted a bright highlighter yellow, and a new cabinet piece serves as the other bedside table and adds a touch of storage close at hand. A pair of oversize white lamps have bases that contain nightlights - a useful feature for a room that will house grandchildren in the years ahead. And the final touch is an artful arrangement of black and white family pictures in a mix of frame styles. The result? The perfect guest retreat!